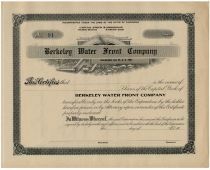 The Berkeley Waterfront Company, operating in the interests of the Santa Fe, bought up large portions of the Albany, Berkeley, and Emeryville shorelines in the 1890s.. These lands remained largely undeveloped until the Golden Gate Turf Club built a racetrack on land leased from the Santa Fe in the late 1940s. 19--, California. Unissued stock certificate. Black / White.